A leadership team's job is to make decisions that keep reality aligned with the strategy, and the strategy relevant to the day-to-day reality. They work on the business, setting strategy, reviewing performance, and safe-keeping the organization’s long term health. This is the strategic level, setting the organization's aspirations. They work in the business, managing teams, monitoring programs, and clearing any roadblocks that get in the way. This is the operational level, grounded in the organization's reality. Using these meetings to determine your strategy and monitor your progress is an incredibly efficient approach to managing a business. 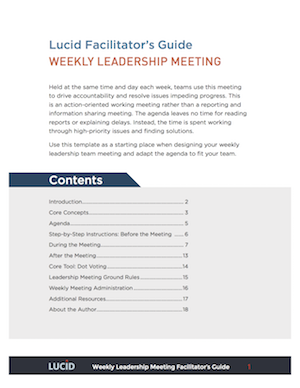 Download these facilitator’s guides to learn how to lead these meetings, and run them however you see fit.